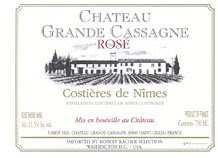 A brand new wine to Georgetown, and our best Rosé for under $10 by far! It has a rich nose of ripe strawberry and spice, with a subtle floral element, a nice texture and a great finish with subtle acidity that pulls everything together! This has all the elements that I look for in a Rosé, and at a wonderful price!